Summer term has begun! We can not believe how fast this year has gone. We have started our new topic- the great outdoors. We will be focusing on a lot of outdoor learning, animals, insects etc. In English we have started our new text ‘diary of a fly’. 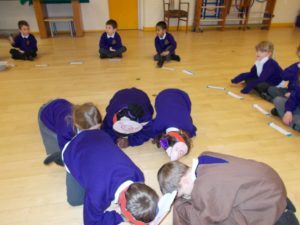 We put ourselves in to the shoes of a fly, using prepositions to think about what we could see if we were a fly from up above or down below. We then wrote our own diary entry pretending to be a fly! 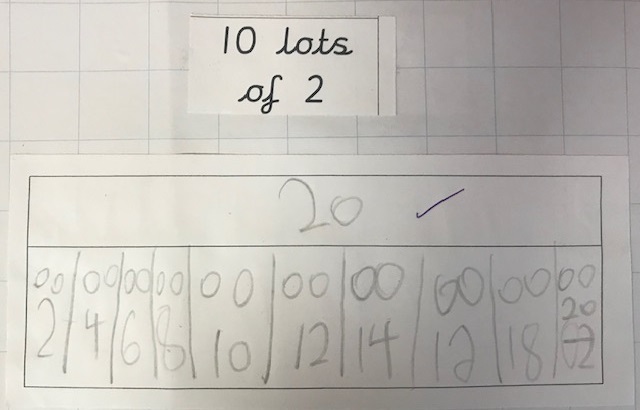 In maths this week we have been focusing on 2 digit numbers. 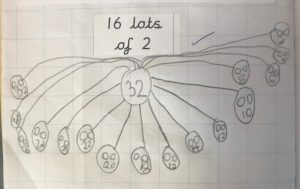 We have been looking specifically at the tens and ones within a number- for example 32 is made of 30 and 2. This term we have our big school trip of the year to Marwell zoo on the 15th May! 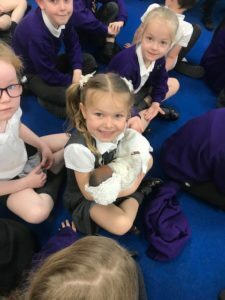 Please check your child’s bag for the letter to be completed and sent back to us as soon as possible. We have limited spaces on the coach for adult helpers, so if you have filled in that you are able to attend we will be in contact with you to confirm whether your support is needed. Thank you for your continued support and getting the letters back to us swiftly. Why go to a museum, when a museum can come to you! We are so lucky! 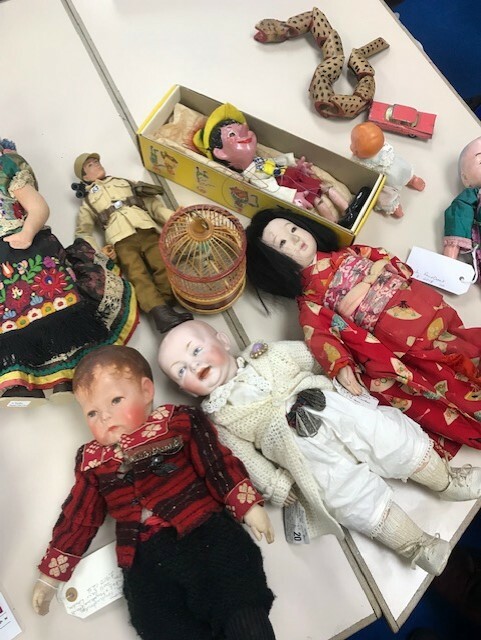 We have had the pleasure of hosting Beryl this week and her collection of old toys. 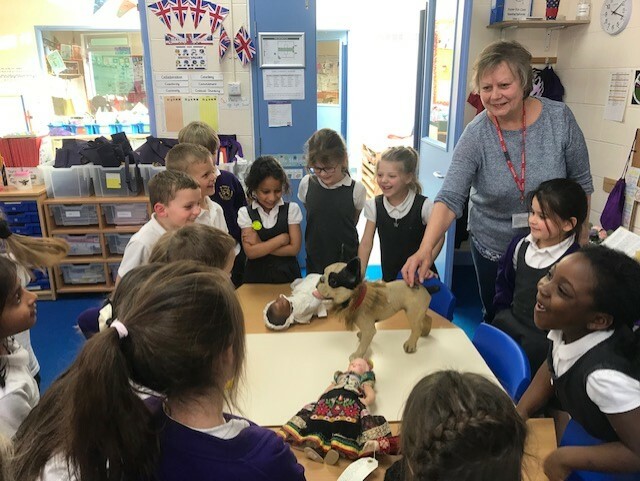 Beryl used to own her own toy museum, so over lunch she brought her toys to the classroom and set them up to surprise the children. Some of her toys were as old as 170 years old! Much to our worry she let the children hold and pass around these toys, an experience we would have never had from a toy museum. Thank you so much to Beryl for letting us experience these precious toys. Thank you to everyone who made the phonics workshop. We really hope it was useful and informative. Phonics is really tricky to teach, if you ever need help or advice you can always ask us. Youtube has lots of helpful videos too- particularly with pronunciation of the sounds. Remember to ‘wear it wacky’ on Monday to raise money for CAFOD. 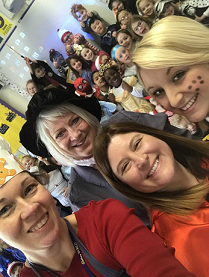 We have had a wonderful world book day. 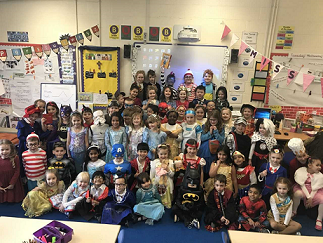 Thank you for all of your effort with their costumes- they looked amazing! 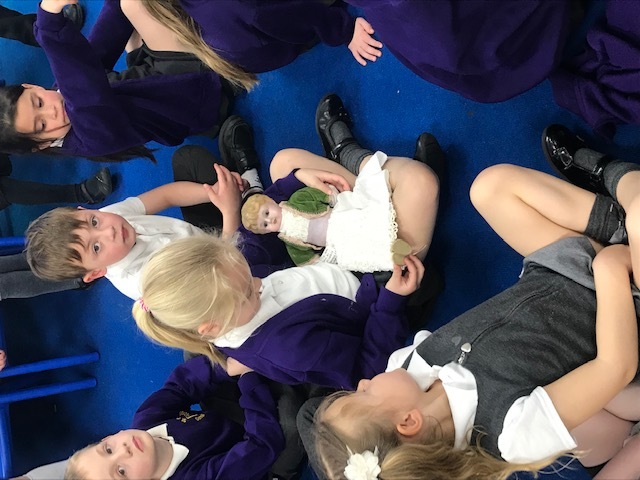 Welcome back to another term, we can’t believe how quick this year is going. We have been enjoying learning outside at the beginning of this week in the sunshine! 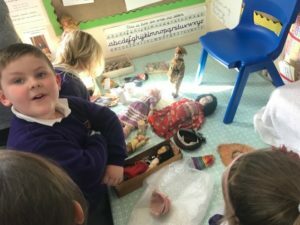 We have started our new topic- Toys! 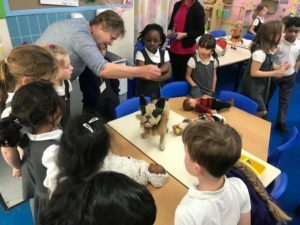 In maths we have been weighing toys using balancing scales. 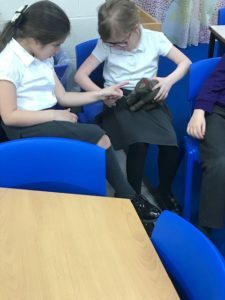 We have been investigating which toys are heavier and lighter. 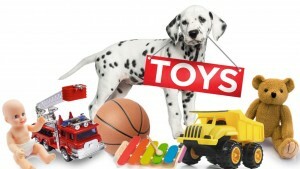 We have also weighed the toys using multilink. In English we have been creating our own set of lego instructions. We found that lego instructions are quite hard to follow without sentences to help us. We also found that prepositions are really helpful in instructions, particularly lego instructions to tell us where the bricks need to go. Below is a video we have found very funny and helpful when learning about prepositions. 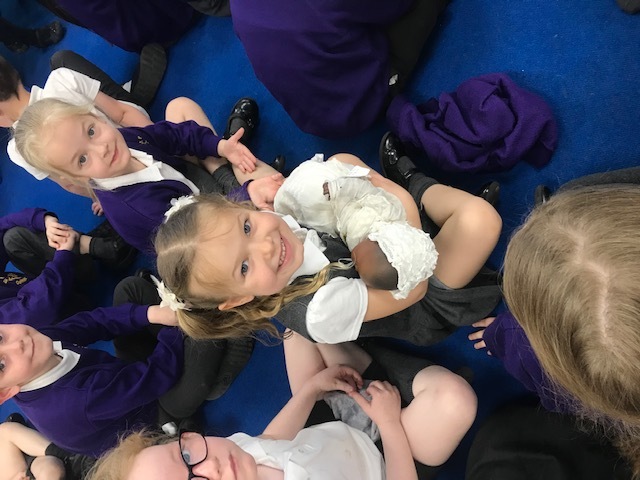 A big well done to everyone who took part in our Year One poetry competition, the time and effort you have put in to learn your poem off by heart is amazing! 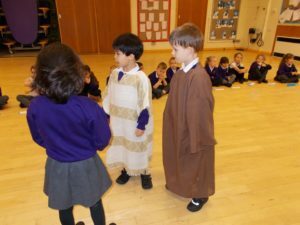 It was really hard to pick just three children to go through to the whole school final- but a decision had to be made. 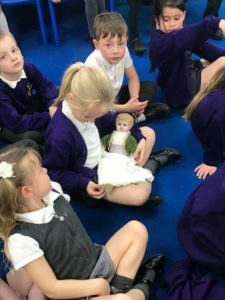 Thank you to everyone who made it to our Year One liturgy this week, we really enjoyed worshipping with you. 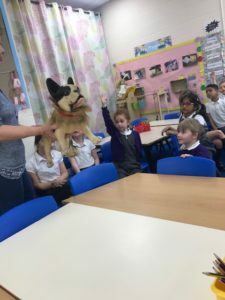 In English this week we have been thinking about things from the wolfs perspective. How does he feel? Would he describe himself as dangerous? 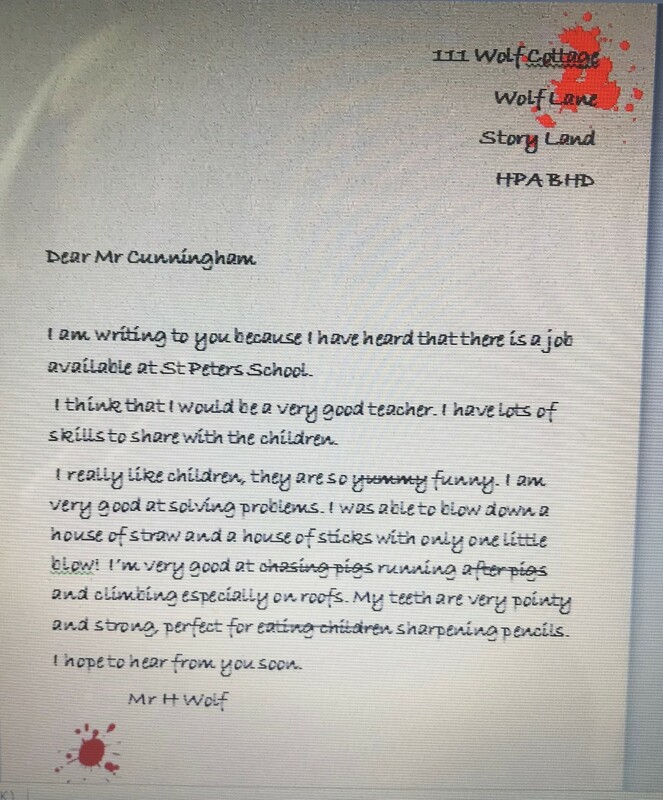 We wrote letters to Mr Cunningham as the wolf to explain our annoyance at not being accepted for the job. 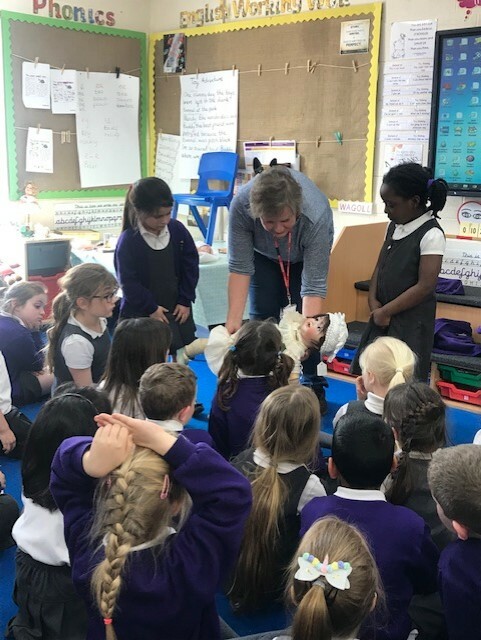 Next week we will be focusing on words ending in ‘ed’ with the help of Goldilocks. Her tummy rumbled at the smell of porridge. Her legs ached and she needed to sit in one of the chairs. In maths this week we have been learning about the days of the week. Below are two of our favourite songs we have learnt. Next week we will be focusing on telling the time. In Year One we focus on o’clock and half past. REMINDER- parents evening times are now available to book on scopay for the 5th and 6th March. 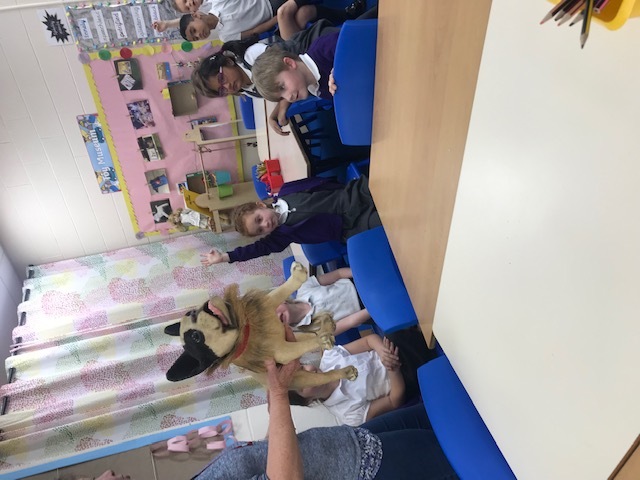 This week we received a letter from the Big Bad Wolf!!! We can not believe it! We DO NOT want the wolf to work here. 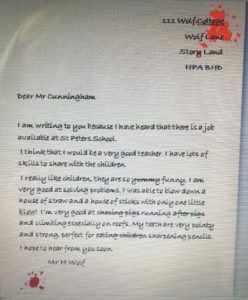 We are very concerned, so have written letters to Mr Cunningham to persuade him not to employ the wolf. Fingers crossed our letters are convincing enough to not employ him. We have been so successful counting in 2s and 10s over the past couple of weeks we decided to transfer these skills to counting in 2p and 10p coins. We went shopping for ingredients to make gingerbread men. 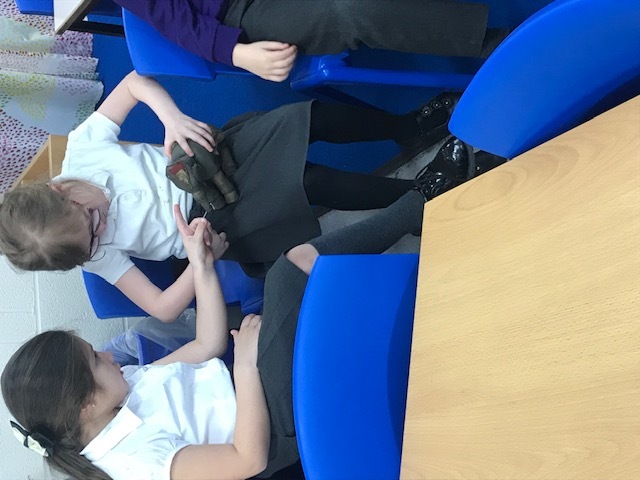 We only had 2p and 10p coins in our purse so had to count carefully. Next week in maths we will be focusing on days of the week/ months of the year. We are sorry if the children come home singing lots of different songs to help them remember the order! 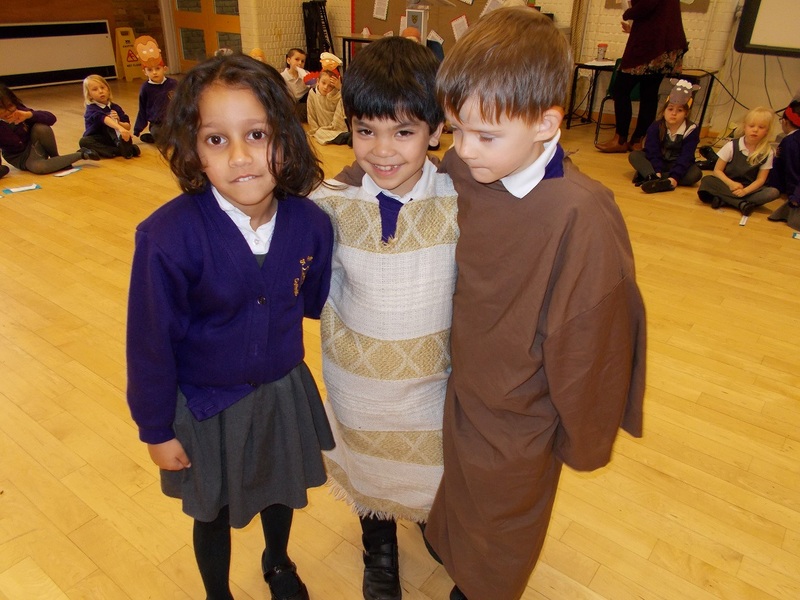 Reminder- Tuesday 5th February at 10:00 is our Year One liturgy. All family members welcome. Have a lovely (maybe snowy) weekend. 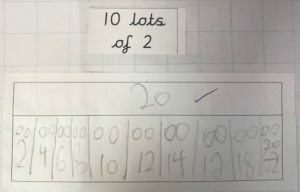 In maths we have been investigating counting in 10s. Only 10 gingerbread men will fit on a baking tray, so we have been using our knowledge of counting in 10s to see how many gingerbread men we can bake if we had 6 trays for example. We have used the same models from last week – part, part whole, bar model and arrays. Next week we will be using our knowledge of counting in 2s and 10s to count 2ps and 10ps for gingerbread ingredient shopping. Reminder- Tuesday 5th February at 10:00 is Year Ones Liturgy. All family members welcome to join us in worship. Have a lovely weekend- wrap up warm! 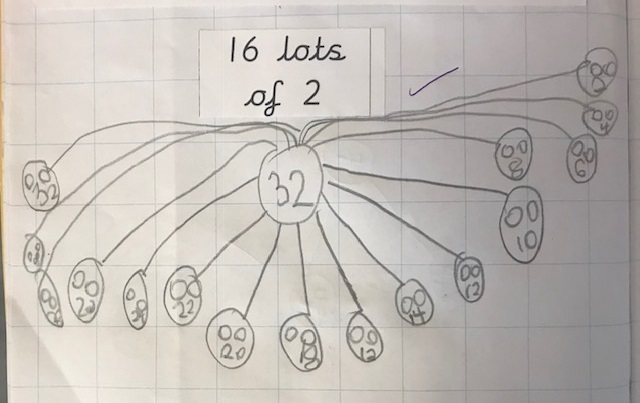 Another week of fantastic learning and we are really starting to understand multiplication. As we said last week, we made Lego houses over the Christmas break. The children had to estimate how many bricks we used, whoever had the closest answer would win a Lego prize. On Monday, we counted in 2s the amount of Lego bricks we used. 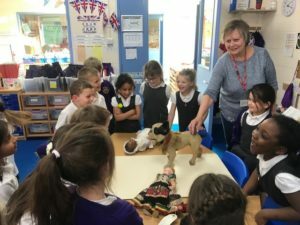 In Miss Shaw’s class Grace Collins had the closest answer. 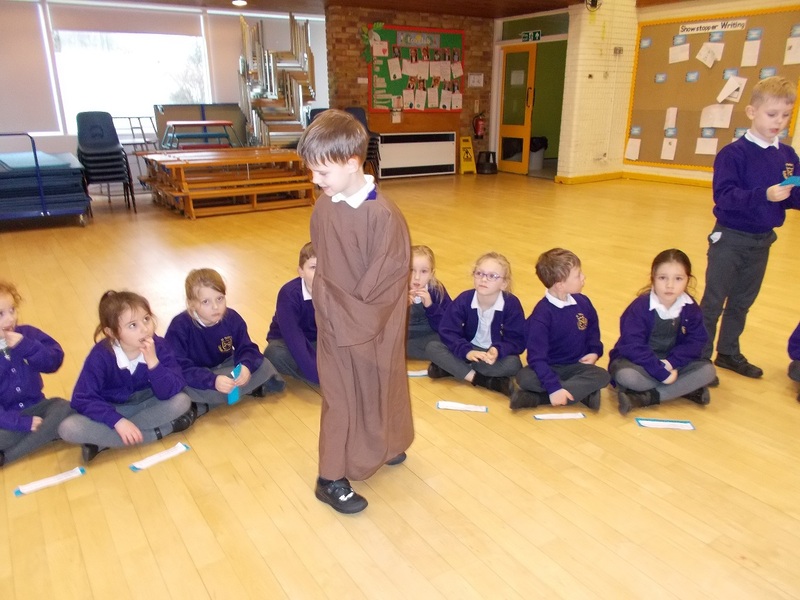 In Mrs Layton’s class, Mathew Walsh had the closest answer – well done! This is a bar model. This is a part part whole model. Welcome back! After a lovely 2 week break it is great to have everyone back in to school and straight in to their learning. 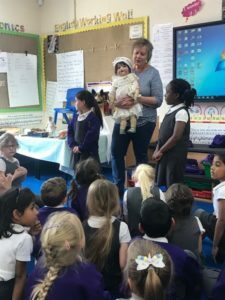 We have started our new topic ‘a tale to tell’ based around fairytales. In maths we have launched a LEGO competition! Over the holidays Miss Shaw and Mrs Layton built their own lego houses. The children have guessed how many bricks they think we used. Whoever has the closest guess will win a lego prize! We have been learning to count in 2s to help us count the bricks quicker. When we have learnt how to count in 2s we will reveal the winner! Ask your children to show you a bar model and a part part whole model and get them to explain how it works. 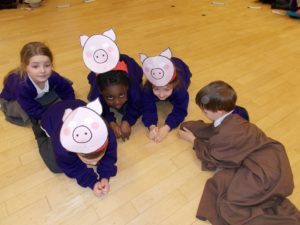 In English we have started our new text- the three little pigs. We have been retelling the story, remembering the well known key phrases. Next week we will begin to rewrite the story. Date for your diary- Tuesday 5th February at 10:00 will be our liturgy. All family members welcome. Have a restful weekend after a busy first week back!